Double wood has long been an unsightly issue for municipalities. Double poles look messy and degrade the look of city streets that residents would rather see clean and orderly. They are unsightly, impede views, clutter landscapes, and can be dangerous. Those original poles still standing next to their new replacements? They were slated for removal for a reason, be it because of structural issues, age, or other problems that have marked them less than fit for duty. The bottom line: they needed to go. Recently some cities have started dialing up the pressure on power, communications companies, and other pole owners to remove unused poles—even if it means fining their own city utility departments. The trend is widespread and entering the spotlight. We have the scoop on a few notable occurrences and why pole owners should take notice of this situation and get any lingering double pole issues under control. In the Pacific Northwest, one major city’s streets seemed positively paved with double wood ("On pretty much every corner," says a former resident and telco employee), causing the local government to virtually declare war on its own electric department. 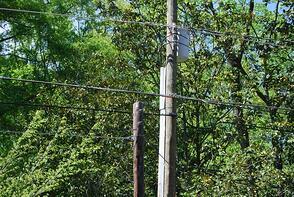 A recent utility pole inspection found that some of the double wood had been standing unused for ten or fifteen years. Equipment transfers had been completed, Presidents had come and gone, but double wood still stood everywhere. The city eventually threatened to fine the pole owners if they did not clean up a percentage of the double wood within a specific timeframe. It lit a fire and the work is now underway, but this situation likely caused tension around the office. In the South, many small towns are turning to tourism to boost revenue. For one community in Kentucky, "beautification" of their quaint village did not include breathtaking vistas full of excess power poles. In this case, the city manager did not know how long it should take a pole owner to remove old poles and came to one of our representatives for advice. The timeline the pole owner appeared to be on was stretching the city manager's patience and he didn't know what the owners were required to do as stipulated by the pole owners' contracts. It was definitely time for a contract review and an action plan created to remove the double wood. Out West, one mountain town received government funding to beautify parts of their community via a grant that came with some "strings" that affected local pole owners. Part of the initiative included burying lines underground to clean up the views along a riverfront. The grant included a timeframe within which all work was to be completed or else the city would lose the funding. To ensure the money did not slip away, the city passed the buck (and the pain) of the time crunch, fining pole owners who did not comply with removal requests in a timely fashion. Pole owners then turned around and fined attachers who did not get off their poles fast enough. A good transfer process coupled with communication software could have presented the opportunity to help solidify these joint use partnerships rather than turning into a mountain of fines. The landscape is changing around us—literally and figuratively—when it comes to double wood. While once decommissioned poles might have been able to sit idle for years without much notice, city governments are now finding new ways to push the process along. The moral of all of these stories? Perform regular utility pole inspections, do the required transfers, and then do the work of removing old poles in a timely fashion. Double wood equals double trouble—so act now.